Opium is a narcotic resin produced from opium poppies (Papaver somniferum). It contains up to 16% morphine, an opiate alkaloid, which is most frequently processed chemically to produce heroin for the black market. The resin also has non-narcotic alkaloids in it. Some of these are papaverine and noscapine. 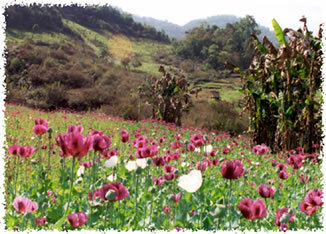 Opium is also known as afeem, and was called "God's Own Medicine" during its time of greatest popularity. It can be yellow or dark brown, and has a bitter taste. Opium has been used and produced for thousands of years. During this time, the source plant has been changed and adapted. The methods of processing the plant, and extracting substance and consuming it also have. The medicinal use of poppies for pain relief dates back to ancient times, but widespread use in patent medicines or as a recreational drug has occurred only in the last few centuries. Drug prohibition laws in most countries have been introduced only during the last century. Today the opium crop is worth in excess of $400 million legally and $7 billion illegally, after processing. Opium has caused many wars in China, such as the Opium Wars, because of heavy addiction to the drug. People who become addicted to opium become dull, lazy, and even sleepy. Opium itself is a very harmful and addictive ingredient and comes in many other forms of illegal drugs; including Heroin and/or Diamorphine. Health risks include, overdose, respiratory depression, risk of HIV if injected, and risk of permanent brain dulling if used for prolonged periods of time. ↑ "opium — FactMonster.com". factmonster.com. Retrieved 20 April 2010. This page was last changed on 14 February 2018, at 04:01.